The Challenge: Spend at least 15 minutes immersing yourself in a field you know nothing about. It was made obvious to me a few weeks ago on a trip to Milwaukee after a near death experience that I would like to learn more about cars. 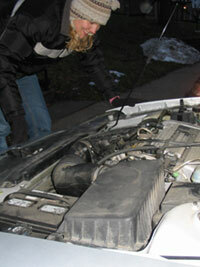 As we were on the side of the road in the snow with car problems, I faced the humbling fact that I wasn’t quite sure how to even open the hood of our Pontiac. “Our hood is tricky,” I rationalized. This is embarrassing for me to admit but a harsh reality. So, I sat down with a “Fix It Yourself” book from Reader’s Digest and some very helpful websites (about.com and howstuffworks.com) and spent my 15 minutes learning Car Parts 101. I have to admit that 15 minutes was not nearly enough. I am still curious about the other parts under there that I didn’t get to. I really only got through the basics of how the car uses the gasoline to accelerate and the chain of command that happens with the parts in this procedure. Combustion, cooling, pistons, exhaust…lots of familiar words that are now clearer with some handy dandy animations. This challenge shined the light on my "perfectionist" side that gets too overwhelmed and often fearful to learn something new. It forced me to become curious and take the risk of looking foolish. Kids just naturally ask hundreds of ‘why’ questions and they are learning new things everyday. It is good to be reminded of that feeling. It was fun! I bookmarked those websites and I’ll be back. I know from watching those behind the scenes Star Wars documentaries that the artists take great efforts to create each planet from scratch, with its own native language, look, and culture. After only a few moments in Lee’s Oriental, surrounded by produce I’ve never seen and labels with words I couldn’t read, I half-expected to hear George Lucas step out from behind the aisle saying, “And cut." I started checking out the jars and jars of sauces; peanuts, soy, and whatnot. Then I came across an interesting package that seemed out of place. The product inside was almost black, and it looked like a small folded Hobbit blanket. It said “dried laver” on the label. Before I could finish asking myself the question, “What’s dried laver?” I noticed another similarly stuffed package with the subhead “seaweed.” Cool. 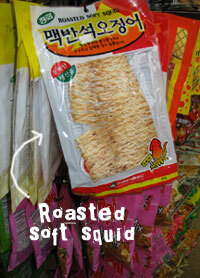 I scanned a spinner of packaged snacks, delighted to find an assortment of dried squid, right above bags of party mix. The squid reminded me of beef jerky — chicken jerky I suppose — and the back of the bag touted it as a great on-the-go snack and perfect for parties. Indeed! On my way out of the store, I came across a row of giant bags stacked near the wall. 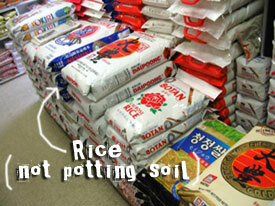 “They sell potting soil in oriental grocery stores?” I asked myself. “Must be for rare, hard-to-maintain Asian flowers,” I answered confidently. Upon further inspection, I learned that they were actually bags of rice. It made perfect sense, of course, but I couldn’t help but fancy the idea of my mom trying to jam a 10 pound bag of rice in the pantry next to the pancake mix and egg noodles. All in all, a pretty neat 15 minutes. Now, if you don’t mind, I need to go find out what lychees are. OK, so I learnt all (well, maybe not ALL) about tuning and playing… the Ukulele. Pingback: Joe’s Ramblings ala WordPress » Escape Plan Day 1 - Learning about cars. I decided to tackle the Escape Plan challenge, and for #1 I thought I’d learn about the world of phonetics. Now I know what epethensis (inserting a vowel, consonant or syllable into a word to aid pronunciation e.g. “um-buh-rel-la”), elision (the opposite of epenthesis e.g. “O’er”), non-rhotic (the letter “R” only pronounced when followed by a vowel e.g. “red” but not “water”), glottal stop (the sound made when the vocal chords are pressed together e.g. the sound in-between “uh” and “oh” in “uh-oh”) and oxytone (the stressed last syllable of a word e.g. “correct”) mean. I also tried to learn a bit of the phonetic alphabet, but that’ll take more than a day! As I stated over at my blog I did start to research cars. I do have some info on car maintenance but due to being sick it’ll have to wait for a sunny day. Looking forward to tomorrow’s task. We decided to do this as a couple. So, we wanted to pick things that we could do together. We chose to do things that involve each other’s interests (fields). Katie: Doug went to JoAnns with me. I think he was the only guy there, and was completely out of his element. He helped pick out some really great scrapbooking items for the honeymoon scrapbook I am creating. I think he picked up some good gift ideas on the way. Doug: I love Saturday Night Live and I don’t think Katie has ever seen a full episode. So, she played Trivial Pursuit, the SNL edition. I dominated and she had no idea what was going on, but we still had fun. I think we were able to find out a little bit more about each other. It was comforting to know that it took us awhile to come up with something. I hope that means that we share a lot of our separate interests with each other already. Hearing the “how to” voiceovers woke up the curious child inside me that has always been fascinated by watching how things are made. I used to spend hours with my grandfather watching him make things in his workshop. In a way this challenge was both new (sneaker & wagon & cookie making) and old (the feeling of being wrapped up in all the steps to creating something). I’m excited to be “creating” a new adultitis-free me! I always check my email in the morning before I go to work (because you’re never sure what important info awaits in your inbox at 6:30 am – LOL). I saw the headline about the WV miners…and being a “suburban girl”, I have no idea what mining is all about, other than the “coal” part of it. So I decided to take on Challenge #1 and learn about coal mining. I looked up coal mining on the Internet, and I was surprised at what I learned! Check out the cool link from the Museum of Science and Industry in Chicago (definitely a fun place from my childhood)! For my 1st challange I decided that still our country has been fighting this war on terror and Islam and Muslims have been in the news daily since 911 I thought it would be a good idea to learn something about that subject. So rather than using the internet I got out my old World Book from 1988 I and M. I figured that this way I could get a more pure idea about Muhammad and the religion, Islam he started without all of the new print stuff out there today. I always thought of them verse us, good verse evil. Being born Christian I didn’t really know about them and Islam. I learned that Muhammad at age 40 had a vision of God and that he believed he was a prophet of God. That their book, the Koran, teaches that God is just and merciful. The Koran denounces usury, games of chance, and the consumption of pork and alcohol. The Koran forbids lying, stealing, adultery, and murder. It teaches the virtues of faith in God, patience, kindness, honesty, industry, honor, courage, and generosity. Finally Islam teaches that life on earth is a period of testing and preparation for the life to come. I decided that Islam has alot of the same ideals as Christianity and the terror movement that we see in the world today doesn’t represent all of the Muslim world and the Islamic religion. The answer to this first challenge actually came to me pretty easily after I racked my brain all day for a topic to research. When I arrived home last night, I met my new housemate for the first time. I was lucky enough to spend about an hour getting to know about this new person. As an added bonus he’s only been in the US for 8 months so I also was able to see his perspective of living in our country and being so far away from home. Still on day one. I spent the day learning how to make FireFox extensions. Details at my blog. Lots of fun. Hopefully tomorrow I’ll be able to celebrate “Over the Flu” day. OK, I’m a late bloomer but I’ll catch up, if I have to pull an all-nighter! I just spent 15 minutes trying to learn how to knit. I just don’t get the infatuation with knitting but at least I tried. Pingback: Toady Joe » Got Adultitis? So, I bought a violin and it arrived today. With all of the assembly (strings and the bridge), tuning, and reseraching care instructions, I probably did my 15 minutes without even having to play it. But play it I did, and badly, too! But I immersed myself in that bad playing and, eventually, managed to get some nice sounding notes out. Never mind that they were just open string positions. And violins are cranky about holding their tune. Mission accomplished. On to #2! Hi there! I LOVE this idea and just wanted to let you know we have started a podcast for girl scout leaders by girl scout leaders and will be including one of your challenges in each cast! We are sooo excited! Keep it up! I have to say, I think that Kim’s challenge was much more creative, and voted as such. It might be that I am used to Asian Food Stores, and don’t see it as a challenge… And, I can tell you honestly that I would eat the Spam over the dried squid any day. 😉 I completed day one the other day, but can’t remember what I did. I think I need to de-frag my brain and start over…. Oh, I remember now. I went to the local museum, and spent most of my time learning about Australian Aborigines – the customs of resolving conflicts, the language groups and their distribution before white settlers, about their tools and weapons. Does that still count as challenge #1??? LOVE this blog – LOVE this concept!! I’m going to go through your challenges, and I’ll keep you posted. If you were to ask my wife about me accepting the challenge you get an exasperated scream! She’s convinced there isn’t an adult bone in my body. Whether she’s right or wrong, I think I need to hone my childlike skills. Besides, it just sounds like fun! Today, rather than call a repairman to fix my ailing telephone system, I’m going to tackle it myself! I have no idea what I’m getting into. Hopefully, I’m prepared for the shock! If I’m lucky you’ll give me a new adventure and save me some money as well. I’ll report on the results tomorrow! Wow! My phones are working for the first time in a week! Finding the problem took place were the wires were brushing one another took some time, but separating them once found was no big deal at all. As with most things that actually function, the phone wires make sense if you take a methodical look at them. I feel good enough about it all that I’m going to install a new jack in a location we long wanted one. That’s this morning’s project, before I get going on Challenge Two. BTW, Guess how I located the phone problem. I just carried a chordless phone around to the various accesses to the snarls of wires than run through my house and wiggled them while listening to the reaction on the phone! Not exactly rocket science, but it saved me around $100.00. I decided to take the challenge with my hubby Chuck. He has already wimped out on day 1. He’ll have to catch up! While browsing The Lemonade Stand last week, I saw a balloon modeling kit. I decided “what the hey” and bought it. I thought it would be a great gift for the nieces or nephews. Yesterday, while pondering this challenge, I spied the box. Wow! What a great idea! I read a little on the internet and opened the box. This is so cool…POP! After more attempts and 30 minutes later, I had several really good balloon dogs and some very pretty balloon flowers. I am hooked now. Gotta find more balloons! Hubby says it is too much noise. I really liked the squeaking sounds! It became more than just an exercise in fun. This was a good exercise in stress and stress relief. I felt my life was a lot like those balloons. If I blew them up a little too much and tried to manipulate them into shapes, they’d POP! Much like I do when I’m already tense and try to deal with problems. If I give myself some breathing room, like in the balloons, the stress of turning and twisting of problem solving doesn’t end up in POP! Instead when it is done, I have a beautiful work of art that makes me laugh and everyone else smiles too. How cool is that? After seeing Kim & Jason at a recent conference, I knew I had to start my own escape plan. I was even able to talk my husband into doing it, too! For the first challenge, Tom & I got out a NatGeo Field Guide to North American Birds. We looked up all the birds found in Illinois and Wisconsin. We decided to take the guide with us on vacation so we can identify what we see. i actually decided i didn’t know enough about history and looked up 18th century history and was shocker to learn things about napoleon and Lincoln that i never new before. however my hidden Gem was Washington Irving, who after learning about his life and his works i realized i’ve never read any of his works! i’ve only seen the movies. how embarrassing, but now i know what i’m going to read next~! I read about how to change out a car radio. My car is basic as can be and I have wanted a cd player but am too frugal to have one put in. Now I supposedly can put one in myself. I am concerned I would get the old radio out and not get the new one in. The take home message… Where would the world be without Legos? Can anyone tell me how much we’re allowed to blog about it? I’m blogging a little but trying not to reveal what the actual challenges are (otherwise people could just copy and not buy The Escape Plan?). I’m excited to hear about how your Escape Plan goes! Feel free to blog to your heart’s content; we’re happy to have you sharing our message with others. If you want to keep some of it a mystery, that’s great, but don’t worry about spoiling too much. Hopefully if people are inspired, they will sign up for themselves. If you could make sure to have a link to the official Escape Plan site, that would be great. I learned about some of the things you can do on minecraft from one of the kids I watched. I kinda knew what minecraft was but he was able to give me some more of the in-depth details. After attending Jason’s presentation I decided that was exactly what I needed to hear. For years I have been giving my job all of my time and energy so it is time for me to turn that around towards my children. And my husband if I can get him to participate (probably not- he’s stage 4 end of life adultitis). So my daughter and I have been thinking about what to do for 2 days. We went to breakfast this morning and we’re brainstorming what to do. Then it hit me!! Duh!! Don’t have the person with adultitis try to figure out what to do!!! The person with adultitis will rationalize everything and come up with reasons not to do what is thought up!! So I sat across from my daughter and thought what is something she likes to do that I have never done… OMG a Musical.ly video- that is 100% leaving my comfort zone. So I said it out loud. Her eyes lit up, now I am going to go humiliate myself on camera… but this is something she never dreamed I would do with her.